Paytm is caught in a big controversy about giving user data to the ruling party during riots and protests in Jammu and Kashmir. This data potentially includes users’ mobile numbers, email IDs, and even Aadhaar data. If you have been following the fallout of the investigation, you would know there is a big #DeletePaytm movement trending on Twitter and other social media. Now that Paytm has shown that it can give away user data when asked by the government, the question many are asking is should you delete your Paytm accounts. In case you’ve been wanting to do the same, or at least want to find out how to go about deleting your Paytm account, you would have seen there’s a lot of confusion. The truth is Paytm does not let you delete the account easily. There are two ways to block your account, which is similar to deactivating your account, one surefire method to delete the account but that also requires jumping through some hoops. So Paytm is not making it easy, but here’s what you can do. NOTE: Some users cannot delete their accounts and only have the option of blocking or deactivating it. Step 1 – Open the Paytm app and tap on the smiley button in the top right corner. Step 5 – Scroll down and tap on “Message us”. Using this option you can raise a request to block your account. For this, you’ll be required to share a screenshot of transaction alerts or credit card statement. Step 6 – After attaching relevant screenshots, tap on “SUMBIT”. 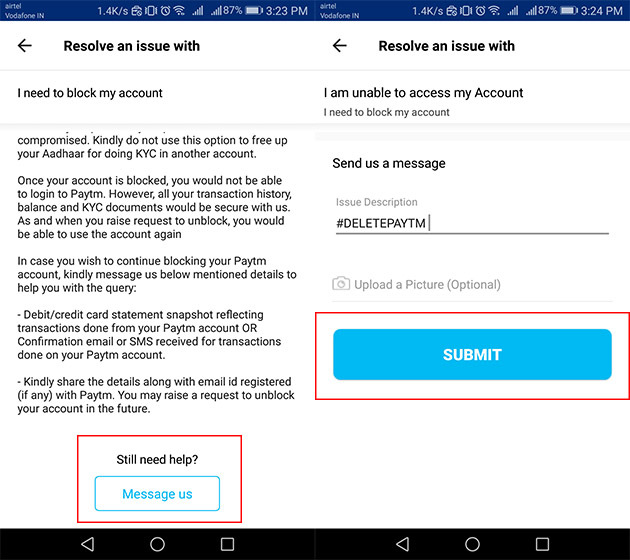 The above steps are limited to blocking your Paytm account and it can also be revived at a later stage. The company’s terms & conditions reveal that it retains your Aadhaar and contact details even after you have blocked the account. To make sure your account is deleted for good, you can call the Paytm helpline 011 33996699. In case you’re unable to reach the number for some reason, you can open the app, tap on profile icon, and select “24×7 Help”. Once the page opens, scroll down and you’ll be able to find numbers for contacting the customer service. Step 1 – The IVR menu will be read out to you and you’ll have to press 3 on the number pad for “queries related to your Paytm account”. Step 2 – Now, you’ll have to wait until the IVR arrives at “close your account” which would be the sixth option. Press 6 to continue. Step 3 – You’ll be required to enter the first four digits of your Aadhaar card so keep it handy. In case you haven’t linked Aadhaar with the wallet, you reach a dead-end here because there is no other option. In that case, you can block your account. Step 4 – If you have performed KYC, enter the first 4 digits of your Aadhaar and you’ll be asked to confirm it. Once you proceed, your request to close your Paytm account will be initiated. As a last resort, you can write to [email protected] requesting that the company permanently close your account, and delete the data. Unfortunately, there are no guarantees that you will get a response or the right action will be taken. 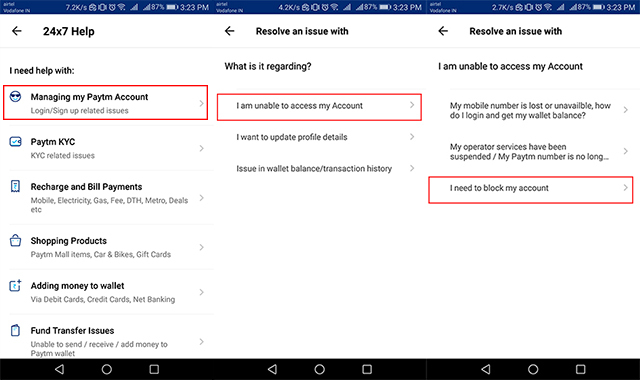 In case, you are unable to delete your account, and don’t want to use Paytm any longer (for whatever reasons) you can choose to block your account after withdrawing any balance.